Hi Lisa - Thank you for sharing your recipe with us. A good sugar cookie is a must for any cook's collection. I snuck one of your cookies for my daughter and she loved it. She wanted to know who made it so she could look at your blog. I'll be sure to show her when I get home tonight. Great to see you again! Lisa, you know I love that guy David Ansel, he is so cool. His soups are amazing. I love his hunters stew, but won't be making anytime soon....I am hoping for summer weather! Sugar cookies are awesome. i could eat them all day if I could. I love that they're the shape of Texas. Next time I make this type of cookie (which will probably be Halloween), I will try your recipe. I have yet to find one I am happy with. Cute TX shape. That's hometown pride right there. In each bite. I've got to say...there's nothing as whimsical looking as a good, old-fashioned sugar cookie. of course... texas! threw me there for a minute. :) you don't ever need an excuse to bake, especially not cookies. but as reasons go, that's a great one. i bet these cookies disappeared quick! Oh my, this pot luck for food blogger such a great idea. Your sugar cookies look so scrumptious Lisa! My Mom received the same book in 1968 for her wedding from her Dad. Lots of my favorites from growing up are in there. This is one that we didn't use, we had another favorite sugar cookie one. But now I'm tempted to go and try them. They look so delicious! I like the way you decorated them. If wish I could attend a blogger potluck. That must have been so fun & good. I want the recipe for the chicken. And those cookies, I would have take couple home. These sound really delicious! Love the shapes! These are adorable! And sugar cookies are my favorite, I like them even better than chocolate chip. I wish I could attend such event! Sounds like fun with lots of yummy food! Tose sugar cookies look so cute and yummy! MMMM....LIsa!! They look so lovely & sugary! I love them allready! Thanks for this easy yet so flavourfull recipe! I love it that they are the shape of the state Texas! Ethel would be so proud of those sugar cookies! They look phenomenal! I'm always on the lookout for great sugar cookie recipes! These looks great, it's so nice to have a fail-proof, time-tested sugar dough recipe. I'm going to try this one since mine is a failure ! Thanks! I love the state spirit! The icing and sugar makes a beautiful decoration too. It was great meeting you too! Thanks for posting the sugar cookie recipe. I'm going to link to it so Cookie Madness readers will see it. I'm still on the lookout for Top 5 sugar cookies, so maybe these will go on the list. I came over from Anna's blog. And I know love your blog. I'm so oging to bake these cookies. I've been looking for the perfect one since forever, this one seems to be it. COuld you alos post the recipe for the RI you used? Those cookies look very delicious and give me a bit of a christmassy feeling too due to all the lovely sprinkles on top! I just found your blog from over on Cookie Madness. 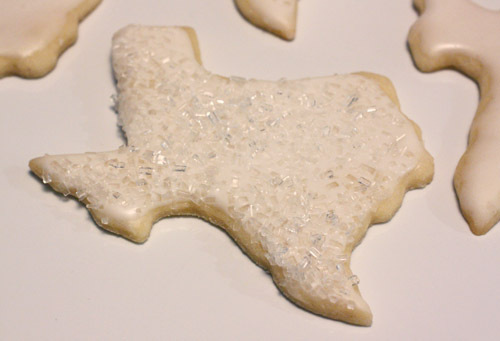 I'm a Texan that just happens to be living in CA & I had to take a peak at your Texas shaped cookies. I need one of those cookie cutters. It would be fun to make some for my CA friends. They probably wouldn't get the humor, though. Ethel's sugar cookies are the best... the older editions of Betty Crocker used to feature "Ethel's" and "Mary's" sugar cookies. We tried them both but "Ethel's" won out. 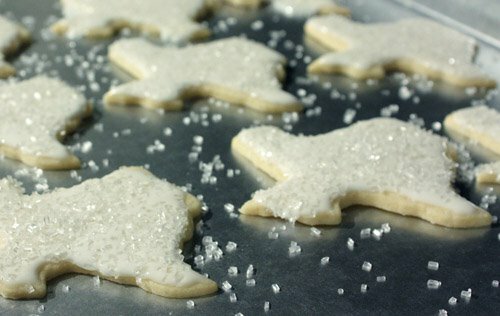 Back in the day, my siblings and I were on the Christmas cookie assembly line and spread frosting or piped frosting according to our age and ability....you had to work your way up from frosting basic star shapes to piping Santa's beard and trimmings! This is great, Lisa, thanks! I always bake for my students at the end of the year and this will be my non-chocolate option next week. I have a TX-shape cookie cutter and a bunch of other fun ones a friend sent me (lobster-shaped biscuits, anyone? ), so I'm really looking forward to making these...and eating a few! I want the cookie cutter... I am sure in the airport stores where they sell the BBQ sauce and other over priced stuff, but I will look on line! I am helping my friend in Dallas in June with a dinner party, but I refuse to cook my own party food :), so we are going out to Babes? Have you eaten at one? That is so cute about how your Mom wouldn't serve any sugar cookie that wasn't properly pale. Just shows how much care she put into baking them. These are the best, my friend introduced me to them a few years ago...she makes her just as pale. 4 minutes 4 seconds in the oven. LOL I was a stalker on ebay for that cookbook and I finally won a copy!! Its in such great shape with a ton of great recipes. Yum!! I bet they just "ate up" those Texas shaped cookies (tee-hee I'm a comedian). I'm far behind but catching up on your blog! These cookies are excellent - I have bookmarked this post as I have been searching for a great sugar cookie recipe. I wonder why the anniversary edition changed the original? If the cookie ain't crumbled . . . ! These are the cutest cookies - being a Texas girl, I WOULD say that, right? The next time I make cut-outs, I'm going to try this recipe...I bookmarked it on delicious. Thanks for a great idea! I also grew up baking "Ethel's" Sugar Cookies, and still do with my children! It's so fun to see it on a food blogger's site. I do use 1/4 cup shortening in place of all butter because that's what my recipe indicates. I should try all butter. "Mary's" Sugar Cookies from the same book were a disaster-spreading all over the sheet. I had read they were like lofthouse-but not this time! The most recent batch of 60 went to Kindergarten yesterday for the kids to decorate. I get compliments every time-even when they're plain. Do you use salted or unsalted butter in these? Thanks! I use unsalted butter. I should have noted that!